No doubt you’ve heard a lot recently about the EU’s General Data Protection Regulation (GDPR). It’s an important piece of legislation, yet some organisations are underprepared. With less than three months until the deadline for compliance on 25th May, here’s what you need to know. You don’t need to wade through pages and pages of legal text. Put simply, the regulation is designed to put personal data back in the hands of the individual who owns it and ensure organisations are transparent about how they handle personal data. Make sure your practices are in line with GDPR. Only collect personal data that you need and only store it for as long as you need it. Don’t store personal data unencrypted on a USB stick, for example, or leave it on an unsecured web server. Data breaches can lead to big fines under the regulation, so keep it secure, encrypted and safe from prying eyes. This person should be properly trained and briefed on their obligations. Depending on the nature of your organisation, this person could be your Data Protection Officer (if you’re required to appoint one), Chief Data Officer, or Privacy Counsel. This is the simplest part of the whole thing. Treat the personal data you collect the same way you expect your personal data to be treated. If you’ve already started thinking about GDPR and have good practices in place, none of this should be a huge problem. If not, don’t panic, but make sure you take action now to get your house in order. Even though it might seem scary at first, GDPR is a step in the right direction for data protection and should be welcomed. Head over to our GDPR centre for more information on GDPR and what Xero is doing to get prepared. If you’re a small business or an advisor to one, you can also check out our GDPR guide. 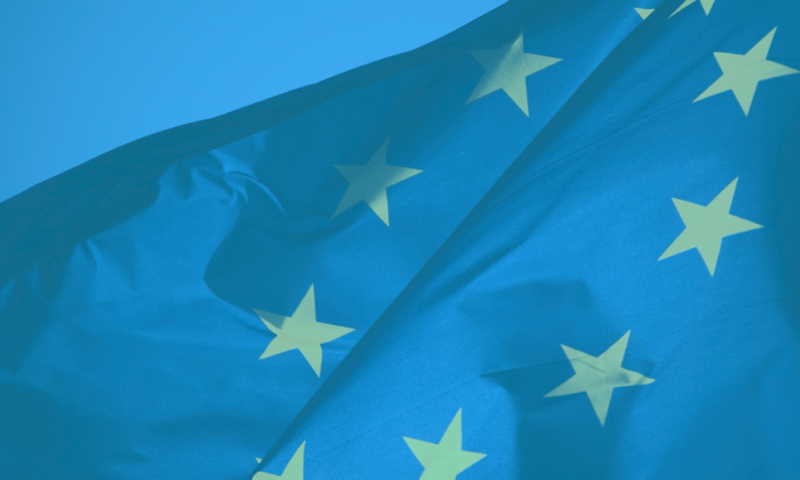 The post 5 things you need to know about GDPR appeared first on Xero Blog. It can be difficult to spot what’s wrong with your business when you’re too close to it. Many retailers recognize this, and that’s one of the reasons why companies hire secret shoppers or store evaluators. These individuals visit the locations of their clients and evaluate each shop’s customer service, merchandising, and in-store experience, among other things. If you’ve ever thought of hiring a secret shopper or wondered what they typically find out when they evaluate their retail clients, read on. We’ve invited Luxury Retail Store Evaluator and Learning & Development Specialist Saira Sethi to share her insights. Saira has over 10 years experience in the luxury retail industry. She has led a mystery shopping department for 200+ stores, and used her role as a store evaluator to identify strengths and gaps across various luxury retail brands. 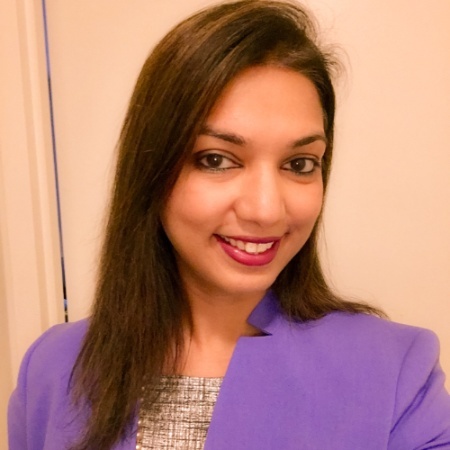 Saira also develops, manages, and leads various learning and development strategies, and she utilizes certified behavior assessment tools such as MBTI and DISC for soft skills, leadership training, and one-on-one coaching. We asked her some questions about her secret shopping experiences and what she thinks retailers can do better. While Saira comes from a luxury retail background, her insights are incredibly useful for merchants of all shapes and sizes. Check out her answers below. 1. Please tell us more about yourself and what you do. I’ve been associated with the luxury retail industry for over a decade. The last few years have been spent training and coaching various luxury brands in their journey towards service excellence. Secret shopping plays a fairly vital role in my area of expertise. I aptly use it as a tool to gauge the service experience across multiple labels. It provides me with insight on the overall brand experience that include areas of strength and areas for improvement. 2. Can you share a bit more about your process when evaluating stores? What are the things that you keep a close eye on? I take my role as a Secret shopper pretty seriously. Being a part of the L&D department, I understand how significant the information can be for those concerned. Any luxury experience for me begins from the time I walk in till the time I exit the store. I observe details including the visual merchandising, music, display and overall cleanliness that account for store experience. Moving to the interaction with a sales associate, I remain objective and neutral. The idea is to assess how the associates portray themselves as brand ambassadors, so I prefer that they lead the interaction. Their body language, enthusiasm, product knowledge and attitude towards customers is what accounts for majority of my feedback. In addition, I take note of any after-sales follow-ups via text messages or emails. 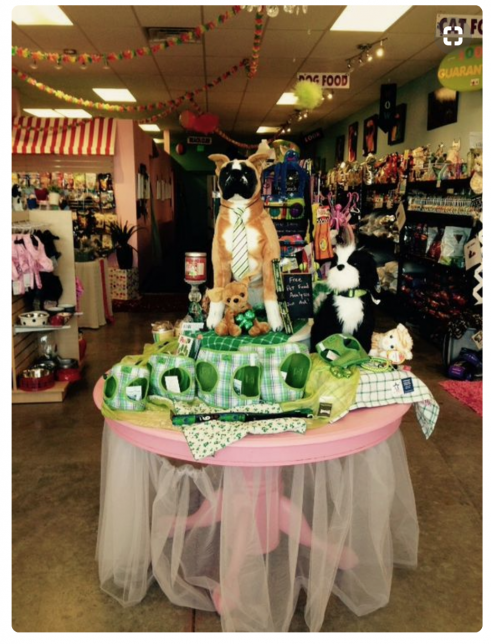 The store’s look and feel – Your visual merchandising music, displays, and overall cleanliness. Sales associates – Are your staff acting like brand ambassadors? Are they enthusiastic and do they have ample product knowledge? Post-sales – Do you or your associates follow up with customers after they walk out of the store? 3. What are the most common things that retailers get wrong, and what can they do to address those issues? Associates tend to be too task-focussed. It would help if they tried to connect with a customer by building rapport. How about getting to know the person you are selling to? The focus tends to be only on that one product that the customer asked to see. For example, if I went seeking a bag, in most cases I’m shown only a variety of bags. Why not introduce me to a wallet or a pair of shoes to complement it? I believe this is a ‘missed opportunity’ to add to the existing potential sale and introduce the customer to other merchandise that might be of interest to them. Most retailers talk about CRM and creating brand loyalty. Customers receive tons of emails on a day-to-day basis that feature sales, promotions or new arrivals. When it comes to luxury brands, I feel that it’s imperative associates take their own personal notes and follow-up with customers. Remembering what your customer liked or nearly wanted to purchase is key information. Often customers forget what they saw or liked in a store until someone reminds them. In my experience, 10% of the stores I’ve visited ask if I’d like to leave my details behind. Out of them a mere 2% actually follow-up on my purchase decision. And when they do, I’m impressed! 4. What are the most common things that retailers get right? Most retailers do a great job at window displays and in-store displays. This is what usually gets customers to walk-in to the store in the first place. Product knowledge is usually up-to-date and I for one tend to learn something new about the brand or the merchandise. That makes it an educative experience for me. What follows suit is the product demonstration. Showing how a dress can be worn differently or the multiple functions of a wallet can lure customers towards the item. Associates also tend to do a fairly good job in handling objections from customers. Knowing how to counter an objection — be it price, disinterest, or indecisiveness — is a significant aspect of a sale. This is where associates are tested on their ability to convince a customer otherwise. Product insights – Keep up with merchandise trends and development! A product demonstration can also help. For example, why not show customers the different ways to wear or accessorize a garment? Handling objections – Identify the common objections that shoppers will have about your products, and be ready to address them. 5. Could you tell us more about the top trends that you’re seeing in the retail sector? Stores are going all out when it comes to marketing, branding and diving deep into the omnichannel experience. I’m starting to notice a lot of emphasis on enhanced window displays and creating a story through the visual experience. 6. What are some of your favorite retail stores? One of my go-to and favorite stores is Sephora at Fifth Avenue. I’m always greeted with a warm smile, offered assistance, and the staff is willing to help me find the right product. Then after I try on their recommendations, the store’s associates don’t ‘push’ me for a sale; instead, they encourage me to feel comfortable before making a decision. I also like how they tell me that I’m welcome to return an item if I’m not satisfied with anything. In my experience, many ‘mass’ brands don’t pay that much attention to in-store customer service. Uniqlo stands out in this aspect. When I visit their 5th Avenue location, most times they’re busy but it isn’t difficult to locate the staff. And often, I’ve observed them proactively approach customers including me, if any help is required. The approach is done with warmth and genuine interest in the customer’s needs. Even with long queues, checkout is handled in a very time efficient, professional and friendly manner. Even though they are related to F&B, I appreciate how friendly and helpful their staff is despite a large influx of people. My go-to is the outlet at UWS (71 & Broadway). The cashiering is done seamlessly and quickly and they always ask the question ‘I hope you found everything you were looking for’. Secondly, while in line to pay, the staff often walk around asking customers if they forgot anything which I think is very thoughtful and empathetic. We hope you enjoyed our interview with Saira! Now we’d like to hear from you. Have you ever hired a secret shopper? What insights did you gain from doing so? Let us know in the comments. The post Lessons from High-End Stores: a Q&A with Luxury Retail Specialist and Secret Shopper Saira Sethi appeared first on Vend Retail Blog. The post How to De-Stress Handling Payments appeared first on Cin7. Suggestive selling is a sales technique that encourages staff to prompt customers to include additional, (generally lower priced) items to their purchase. Upselling or add-on selling are terms that are used interchangeably with suggestive selling. The aim of suggestive selling is to persuade customers to buy items that they hadn’t considered when entering the store. 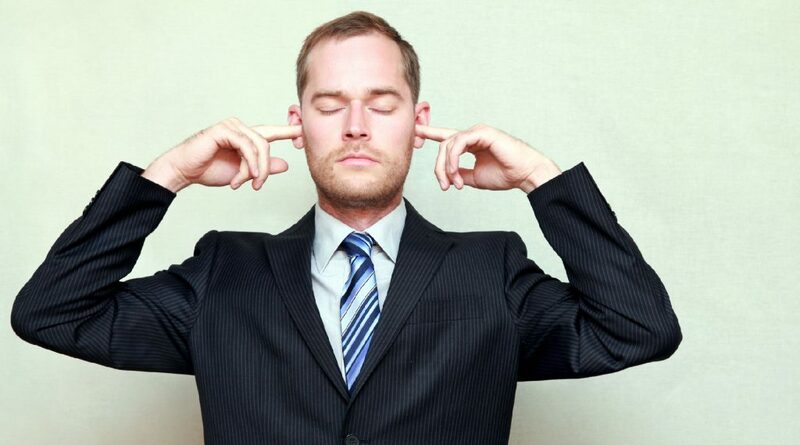 Customers need breathing space when they come into your store. They need time to browse or locate the item they’ve come to buy. 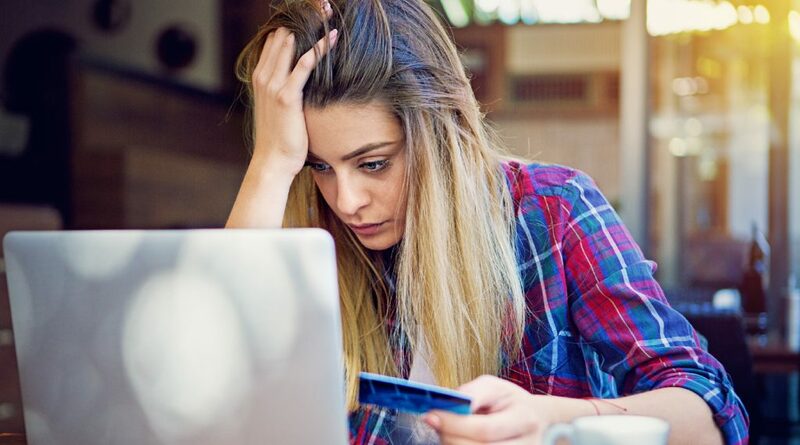 When your staff implement suggestive selling tactics too soon without starting a conversation, customers are likely to withdraw, because of the hard-sell approach. The ideal time to make suggestions is when your staff have developed a rapport with the customer because they’ll have a better idea of what the customer is looking for. Another good opportunity to make suggestive sales is when a customer already has a product in their hand. Objection handling also provides a chance for your staff to not only convince the customer of the item in question but to suggest complementary products. Due to the proven benefits, training your staff on suggestive selling should be a key part of your business strategy. 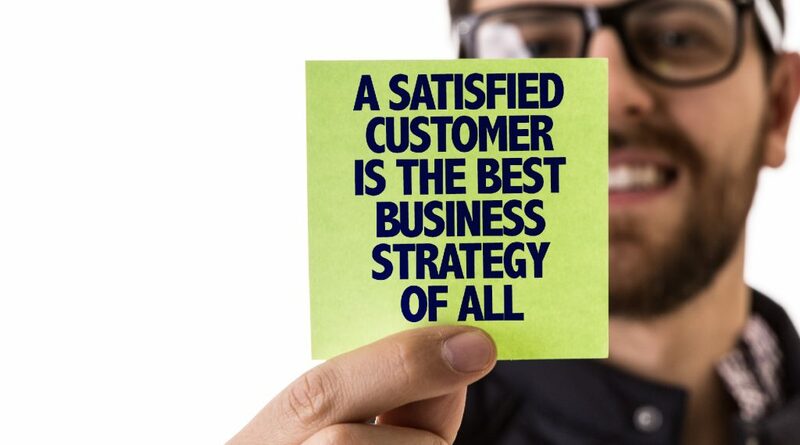 Although suggestive selling is typically easier than getting the first sale, (because your staff is persuading a customer to buy something of lesser value) recommending complementary products still requires special skills combined with exceptional customer service. An increase in sales is only one advantage of suggestive selling. When staff have been trained to implement suggestive selling the correct way, your business will benefit from a higher level of customer satisfaction because of the personalized level of service offered. Apparel retailers can suggest additional clothing items, for instance, a shirt to accompany a new suit. Bars could train their bartenders to offer appetizers with particular drinks. Automobile dealers might recommend supplements like extended warranties or additional features, for example, seat warmers. Travel agents could use suggestive selling by offering add-ons like travel insurance and car rental deals. When formulating a training plan for your staff on suggestive selling, you should focus on the importance of timing in relation to making the suggestion. If staff make suggestions for customers to buy additional products at the wrong time, your business may end up losing the original sale if the customer becomes irritated. It will be difficult for your staff to carry out suggestive selling if they’re not aware of the items you have in store. A selected portion of your staff training should include detailed descriptions of new items. If you own a large retail store and receive vast quantities of new stock on a daily basis, provide at least one unique selling point (USP) per item. The USP should be easy for staff to remember and must be relatable enough to introduce into a conversation with your customer. Your staff should also be familiar with price-points to suggest items within the customer’s budget. Having in-depth knowledge of inventory also extends to stock levels. Your customer will be disappointed if they’re convinced to buy an item, only to find out that it’s not available. Utilize your inventory management and point-of-sale systems to ensure your staff has access to accurate stock level reports. Half of customers (50%) want expert advice on what they should purchase when they come into a store. Over two-thirds of customers (73%) advised that product knowledge is the most important thing they need from a salesperson. Sales people who are educated about their product sell up to 123% more than others with no training. Your suggestive selling staff training should include customer befriending techniques. Customers buy from people they trust and this also extends to suggestive selling. Your staff should be encouraged to take a genuine interest in the customer. This goes beyond what they’re shopping for. A simple question about how the customer’s day is shaping up can result in a positive dialogue. This open conversation will not only build a rapport to increase the likelihood of an upsell, but it’ll also make your staff’s job more enjoyable, as they learn new things about the customer. When a customer regards sales staffs’ interest as genuine, as opposed to just chasing a sale, they’re more likely to listen to advice. Train your staff to think about how they’d like to be treated when shopping and try to replicate this in your store. Your sales staff should become a trusted advisor or friend to the customer while in your store to increase the chance of making a suggestive sale. Training your sales staff to be motivated by both enhancing the customer experience and increasing their commission will result in a more authentic interaction with shoppers. Apart from fast food retailers, there’s rarely a one-size-fits-all approach to suggestive selling. Train your staff to use their inventory knowledge and customer information to propose appropriate products. Even though suggestive selling normally centers on offering lower prized items, there may be occasions when your sales staff can recommend a higher priced product. An example is where there’s a scenario in which a customer is attending a wedding and has chosen a dress. Your sales staff can suggest shoes at a higher price while saying something along the following lines “the shoes truly completes the outfit” or “the shoes will match different outfits and can be worn on more special occasions, so they can be regarded as an investment.” Offering higher prized items when they are discounted is an even more effective way to make a suggestive sale. The fact that the customer is making a saving should be highlighted. Delivering a cookie-cutter suggestive selling experience will be off-putting to customers. Customers want to feel like you genuinely care about them and personalization is a proven way of delivering a better retail experience. Unoriginal responses come across as fake and customers will be reluctant to believe what your sales staff is saying. If a customer asks for an opinion about an outfit that’s not the most flattering, your staff should be trained on how to break the news tactfully while offering alternatives. Listening to the customer will also provide clues about how to personalize suggestive selling. If they mention that they’re looking for a pair of sneakers for running, suggest insoles for a more comfortable running session. 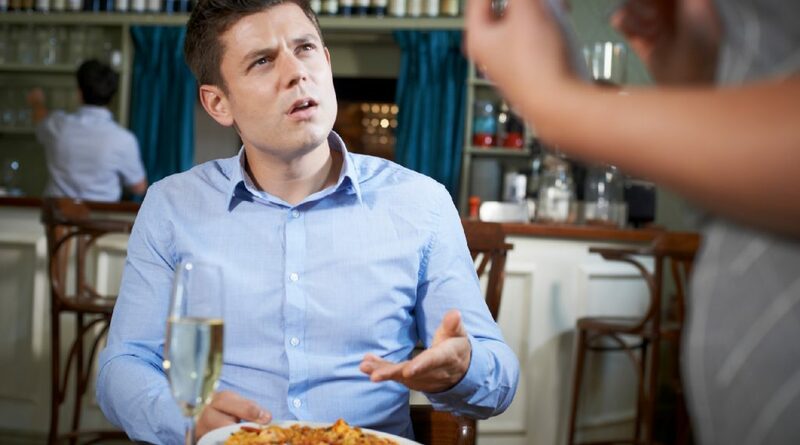 Another instance of personalized suggestive selling is when a bartender or barback recommends an appetizer based on whether a customer will be having dinner after their drinks. The bartender should suggest a light appetizer like pretzel sticks if the customer is dinning after drinks. However, the bartender should recommend something more filling, such as buffalo chicken wings if the customer is only having a drink. When training your staff on suggestive selling, demonstrate items that fit together. This will spark ideas about how a group of products can be customized according to the customer’s taste. In order to increase the probability of a sale, your staff should aim for the suggestive sale item to perfectly complement the original item. Take inspiration from Starbucks, and combine suggestive selling with a loyalty program to skyrocket your profits. Starbucks revamped its My Starbucks Rewards loyalty program to focus on rewarding customers who spend more. The results were an increase of 18% in net revenue, which amounted to $4.9 billion. Under the old loyalty scheme, customers would need 12 stars to qualify for a free item. The new loyalty program changed the number of stars required to 125. The change provided a great opportunity for Starbucks’s staff to make suggestive sales. Their sales associates encouraged customers to add one more item to their order to gain more stars and qualify for free items. 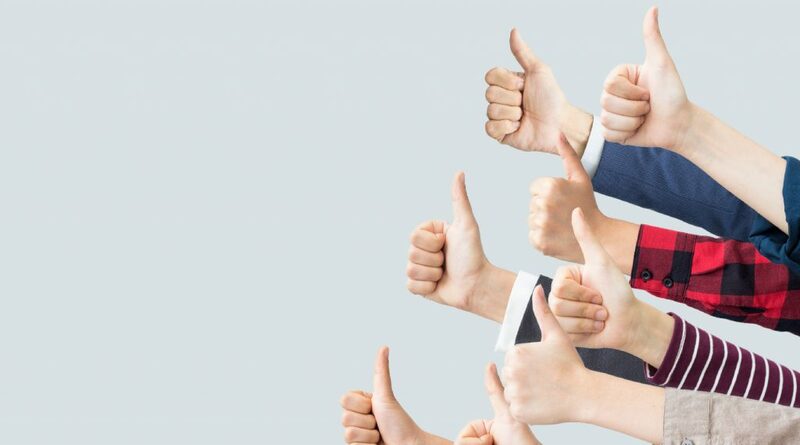 A customer loyalty program should form part of your suggestive selling strategy and training because it encourages customers to spend a little more to get closer to receiving a reward. Suggestive selling becomes easier when your staff notify customers that they can receive a discount or, a free item for spending a few more dollars. Loyalty programs create a win-win situation for the customer. Firstly, they walk away with a supplementary item and they also get closer to redeeming an offer on their loyalty card. If you do implement a loyalty program, train your staff to link their suggestive selling to the great discounts on offer. The five tips above will help you to train your staff on the very valuable skill of suggestive selling. Demonstrating how your staff needs to make suggestions to increase sales should be a continuous process and ought to be a feature in most training sessions. Set the parameters of suggestive selling by ensuring that your staff is up to speed with your products and how to engage customers. Then, trust your staff to use their personality and their unique touch to increase sales by recommending additional products. Suggestive selling can mean extra profits for your business. Arm yourself with the right technology, sales training, and tools you need to get the job done. Deputy gives businesses the tools to transform operations and manage employees easily, whether it’s a first shop or a global network. Sign up for a free 30 day trial with Deputy here. 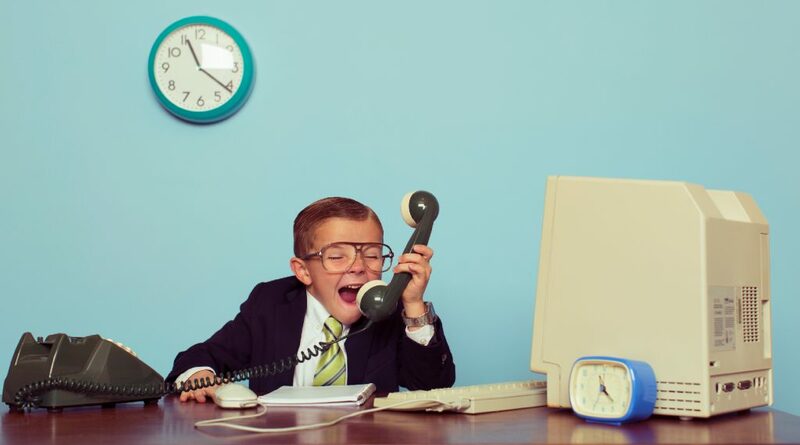 The post 5 tips for training your staff on suggestive selling appeared first on Deputy. St. Patrick’s Day is less than a month away, and while it can sometimes seem that this Irish holiday is much bigger for bars or events spaces, the fact is, virtually any type of business can get into the St. Patrick’s Day fun. And if you’re a retailer, this day presents a tremendous opportunity to win customers and sales. In 2017, the NRF anticipated St. Patrick’s Day spending to reach $5.3 billion — the highest in the survey’s history. And while the NRF has yet to release this year’s survey results, we can still expect an uptick in spending, as consumers prepare to celebrate. To help you get the most out of St. Patrick’s Day, here are 8 marketing and promotion ideas to try in your retail store. The best way to show people your St. Patrick’s Day spirit is to… well, show them. Decorate your store for the occasion. 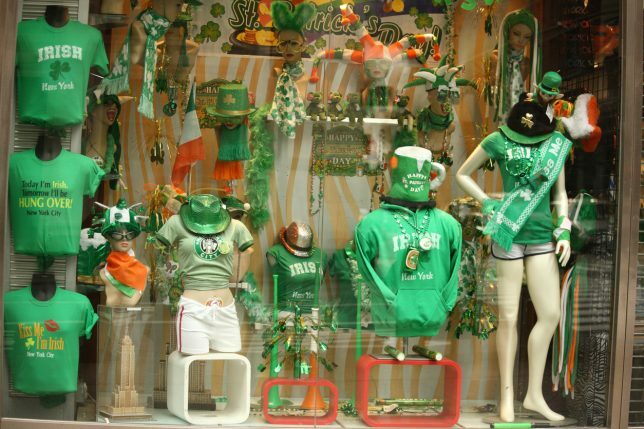 A souvenir store in Manhattan filled its window display with tons of St. Patrick’s Day apparel and accessories to showcase their themed inventory. 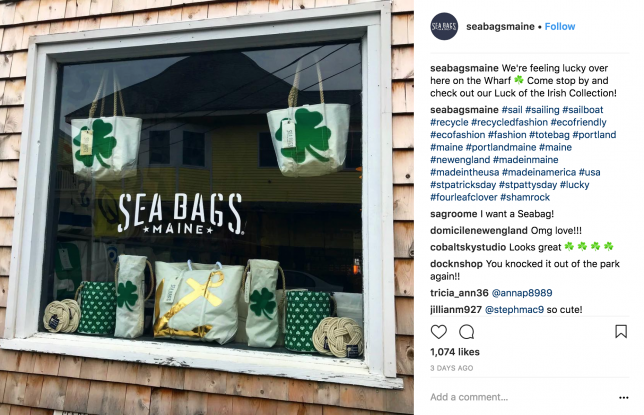 Similarly, Sea Bags Maine, a store that sells tote bags and accessories, has their Luck of the Irish Collection front and center in their window display. Consider doing the same thing in your store. If you’re selling green merchandise or if you have a collection that’s relevant to the holiday, display those products loud and proud in your shop. Another way to generate buzz is to come up with designs or collections specifically for St. Patrick’s Day. Limited edition designs or products work great because not only are they relevant to the season, but they’re not widely available all year which means you can promote a sense of exclusivity or urgency when selling them. Check out ShanOre®, a store that sells Irish handcrafted jewelry. 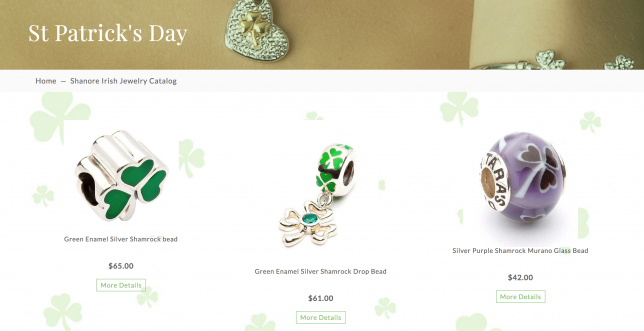 While Irish themes are common for the brand all year round, for St. Patrick’s Day, ShanOre is promoting their Shamrock Collection, which consists of beautiful jewelry featuring (you guessed) it shamrocks. For best results, make an effort to drive up the excitement even before you release your collection. Build anticipation by talking it up in-store as well as on social media. Have a look at what Happy Creek Chic did. To get their followers excited for their themed shirts, HCC posted an Instagram photo announcing that their shirts will be available soon. If it makes sense for your business, consider running a deal or promotion for St. Patrick’s Day. Look at what you have in stock and identify products that you need to move. Then, come up with a St. Patrick’s Day themed promotion. Tack a 17% discount on select products. St. Patrick’s is celebrated on or around March 17, so this is a good way to stay relevant. Attach a shamrock to the products you want to move, and include a discount. Offer a promotion to people who come into the store wearing something green. Put your green merchandise on sale. This is bound to be a popular one. According to NRF’s St. Patrick’s Day survey, 82.5% of respondents plan to celebrate by wearing green. Here’a great example of a retail putting this tip into action. 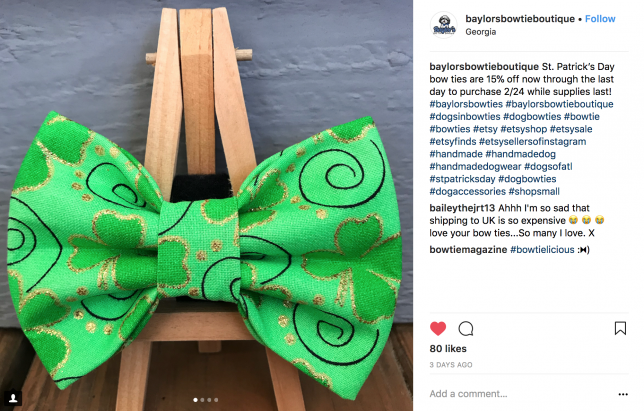 Baylors Bow Tie Boutique, a store that sells dog bowties and flower collars, is running a promotion for their St. Patrick’s Day bowties. Make it easy for people to find your collections or promotions by having them all in a dedicated place in your store. If you have an ecommerce site, this means you should set up a “St. Patrick’s” category or page, and then promote it on your homepage with a special banner. You could deck your whole store with green props and merchandise, but if your employees aren’t in on the St. Patrick’s Day fun, then your efforts will fall short. So, let your employees to show their St. Paddy’s day spirit on and around the day itself. Get them to wear green; use props like pins or hats spice up their attire. You can also encourage them to interact with shoppers celebrating the Irish holiday. Perhaps they can use it to start a conversation with customers. Get creative. Meet with your staff and together, cook up ways to connect with customers on St. Patrick’s Day. If you have a highly engaged community, why not throw a St. Patrick’s Day event? Serve food and refreshments and come up with fun activities that attended can get into. 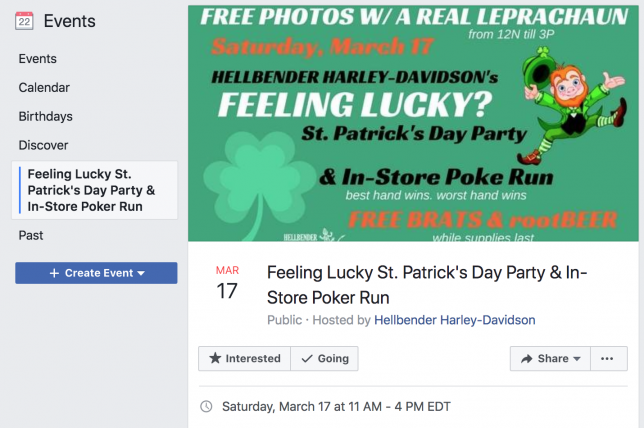 The dealership is hosting the Feeling Lucky St. Patrick’s Day Party & In-Store Poker Run, an on-site event where people can play poker (best and worst hands win), enjoy food and refreshments, and even get a photo with a real leprechaun. Consumers celebrating St. Patrick’s Day are on the lookout for recipe, decor, or even outfit ideas. This gives you the perfect opportunity to share relevant content — particularly if you’re selling something that they can use. For example, if you’re a food or homeware store, why not publish recipes or party guides for occasion? 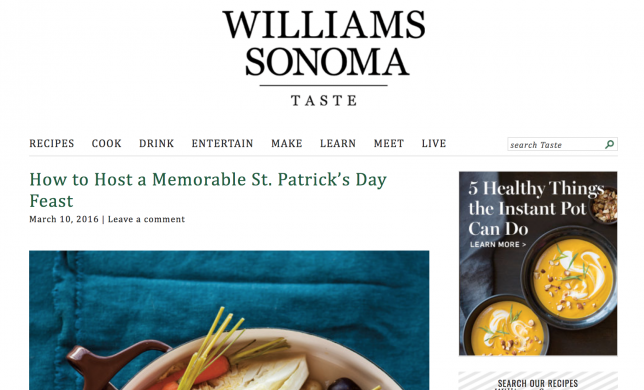 That’s what Williams Sonoma did in 2016, when it published the article How to Host a Memorable St. Patrick’s Day Feast. Are you a fashion retailer? 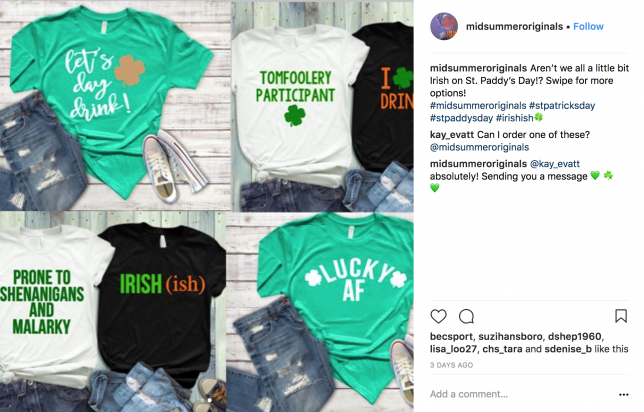 Why not put together some St. Paddy’s outfit ideas, like what Midsummer Originals is doing? And when you publish your content, be sure to mention or link to any related products that you have, so shoppers can easily find and buy them. 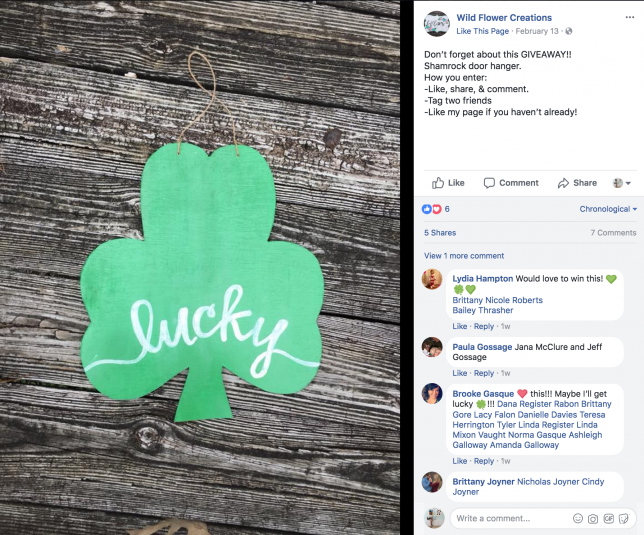 Being lucky is a common theme for St. Patrick’s Day, and it’s something you can use to drive engagement (and possibly sales) around the holiday. You can accomplish that through giveaways. 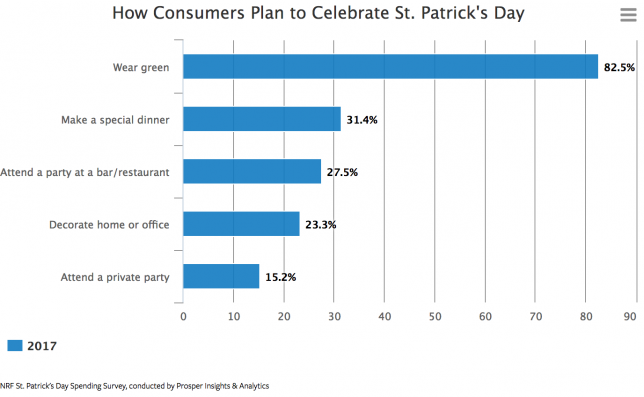 “Luck” may be a common theme for St. Patrick’s Day, but don’t rely on it alone to drive engagement and sales. If you want to “get the green” on or around March 17th, you need to act early (read: now) and prep your store and your staff. We hope this posts helps you do that, and if you try these tips be sure to let us know! What are your plans for St. Patrick’s Day? Leave a comment below — we’d love to hear from you. 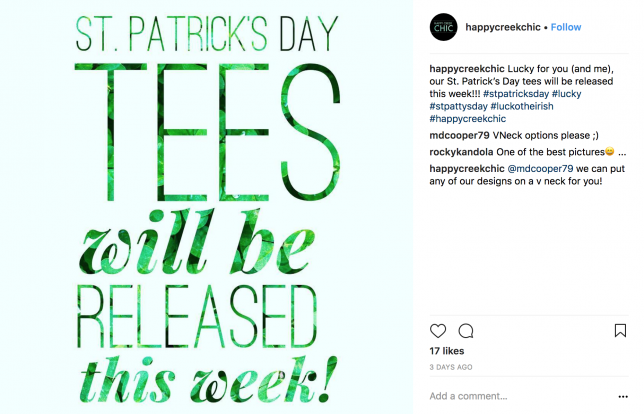 The post 8 St. Patrick’s Day Promotion and Marketing Ideas for Retailers appeared first on Vend Retail Blog. eBay, Amazon, or both? We ve done the research so you don t have to! 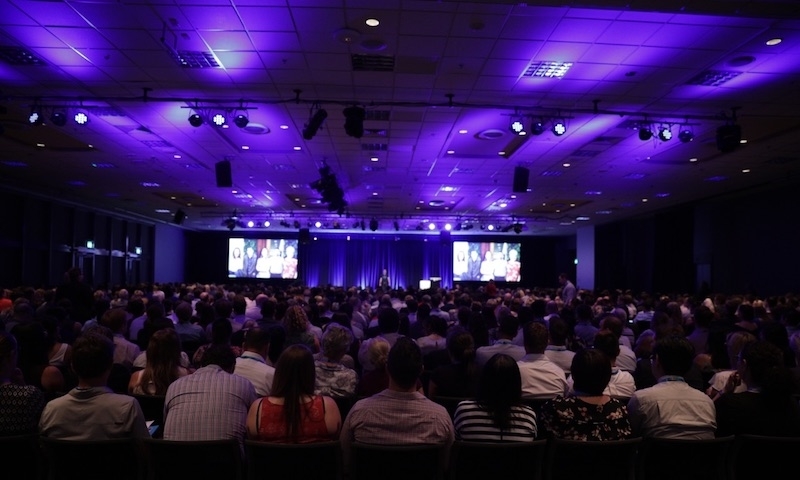 After heading to 20 locations, meeting hundreds of partners, and handing out thousands of jelly beans, the Australian roadshow has come to an end for 2018. Adding favourite apps from our app partners. Now’s the time to bring these learnings back into your firm. The latest tools can reshape the way you work and help you find new ways to use your time to its fullest. Here are some key takeaways you can action right now. Cut down on numerous requests for client information with Ask. The feature of Xero HQ uses a query portal where your clients answer your questions and attach documents you’ve requested. By simplifying the information gathering process, Xero HQ Ask puts the power in your hands, making compliance more efficient. Discover more about HQ Ask. If you’re not one of the more than 3,000 practices already lodging via Xero Tax, take the time to consider Xero as your future tax platform. While you’re at it, set up two-step authentication so you comply with the ATO operational framework that’s coming in March 2018. Two-step authentication adds an additional layer of security to ensure your data and your clients’ data is safe and secure. You can also go paperless with Adobe Sign and Dropbox. E-sign is the simple, legal way your clients can electronically sign documents you send them from within Xero Tax, keeping all your tax-related documents in a secure, centralised online place. Try Xero Tax now. At the roadshow, we unveiled how, with Xero Projects and Xero Expenses, your business can manage activities in the field and then bill expenses against the project. Xero Projects is the simple way to track the time and money you spend on each job, giving you visibility of your project financials from anywhere. Xero Expenses allows you to snap photos of receipts and automatically create the expense claim in Xero – without ever touching a scrap of paper. It can then provide reports and analytics to help you better understand spending patterns. These tools will great for your clients who do project-based work or those who need to reimburse expenses (eg, they have sales reps on the road). You can try them out in your practice first – they’re included in your free Xero subscription. Xero Projects is here now, and Xero Expenses is on it’s way. This is your time and it matters, so consider what steps can help you make your firm the most digitally efficient. For all the roadshow resources, head to the roadshow highlights page where you can read articles, watch product demos, or attend a live webinar. And if you want to relive the roadshow check out the special edition of Xero Now. Not yet a Xero partner? The Xero partner program rewards you with a range of benefits that you can tailor to your own practice goals. Join the program today. 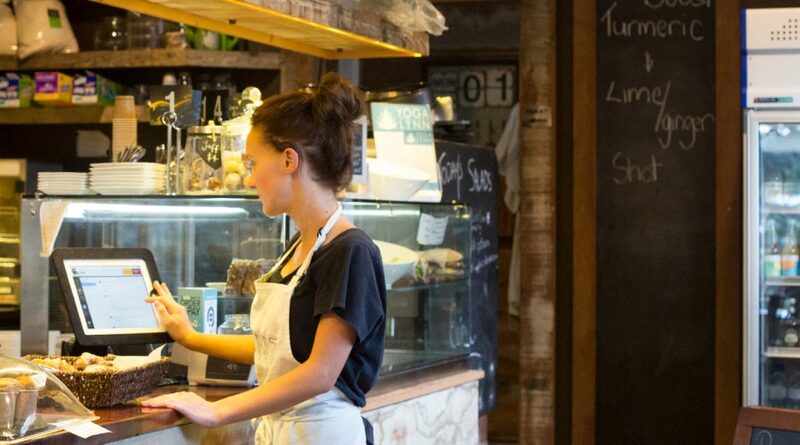 The post It’s your time: make the most of Roadshow Australia appeared first on Xero Blog.